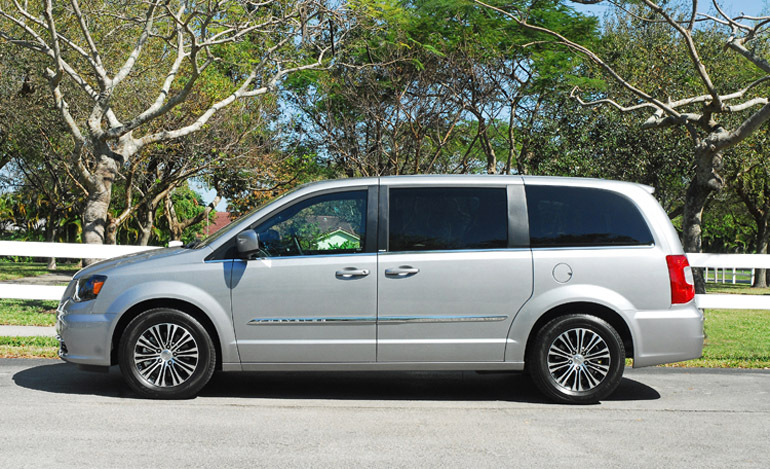 The new 2014 Chrysler Town & Country S minivan helps celebrate the 30th anniversary of the minivan by bringing modern design to the minivan segment. First introduced in model year 1983, the segment that Chrysler invented with the Dodge Caravan/Plymouth Voyager, the Town & Country was introduced in 1989 bringing more luxury and innovations to the segment that continues to grow as today’s families, couples and active singles enjoy the fun-to-drive and improvements found in the Town & Country. The Caravan/Voyager and Town & Country were the first to introduce more than seventy-eight minivan-first innovations among these innovations were-power-sliding side doors, a power liftgate, power opening rear quarter panel windows, and ‘Stow N Go’ underfloor storage. With over 13-millions minivan sales later the Town & Country also features the industry-exclusive Blu-Ray player with dual screens and HDMI input for video game systems. The Town & Country still leads the way with the best, most state-of-the-art vehicle to move people and their things. 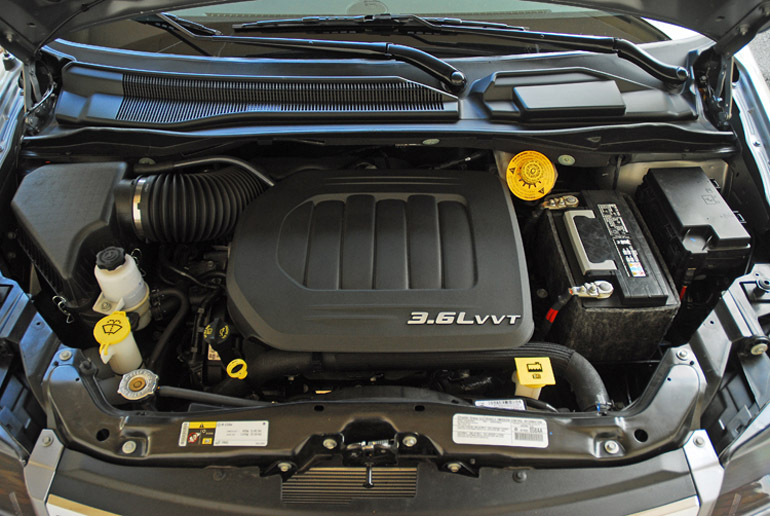 The Town & Country features a 3.6 liter, DOHC, 24-valve, all-aluminum V6 with VVT that gives best-in-class 283hp/260lb.ft. of torque with a flat torque band and excellent fuel economy. This powerful V6 engine is mated to a smooth shifting 6-speed automatic transmission with adaptive electronic controlling modulated torque converter clutch and Autostick that allows me to change gears manually to accelerate even more quickly. 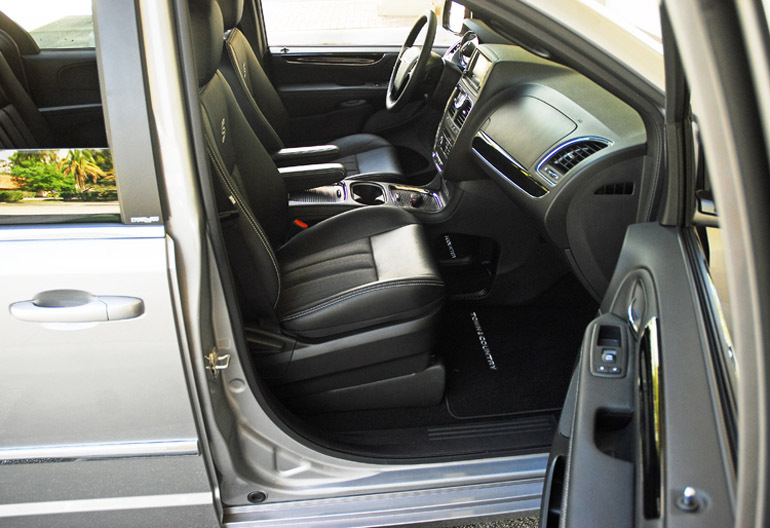 I tested the 2014 Town & Country S model that receives revised exterior trim that adds contrast to the minivan’s typically bright exterior treatment. A black chrome grille is combined with black-background Chrysler Winged badges front and rear, a black rear fascia step pad, ‘S’ model badging, 17 inch aluminum wheels with polished face and black-painted pockets and blacked-out headlight bezels. 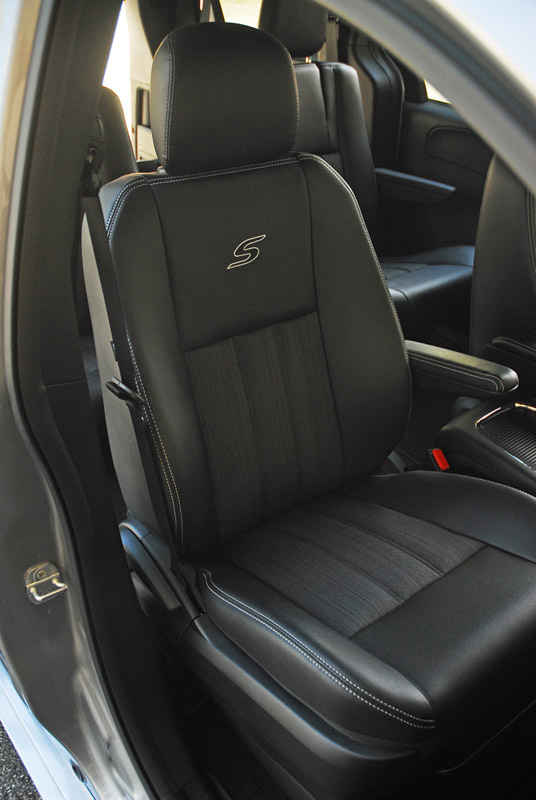 The interior features a monotone black interior unique to the Town & Country S. It starts with the Black Torino leather seats with an ‘S’ logo embroidered in the seatbacks and black Ballistic cloth seat inserts. 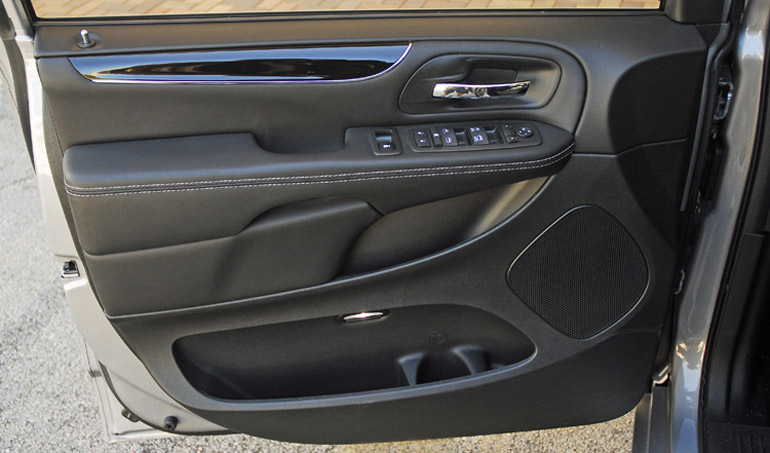 The seats also feature gray stitching as do the door armrests. 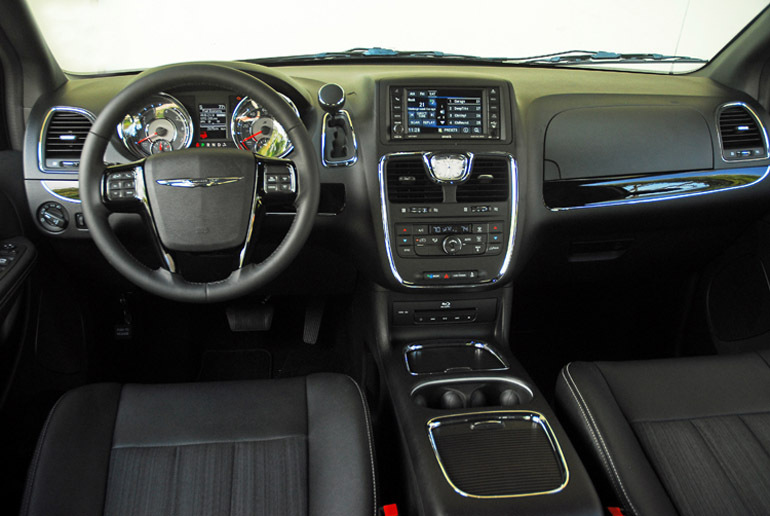 Piano black gloss appliques are found on the instrument panel and on the spokes of the black leather-wrapped/tilt/telescopic steering wheel, and the Chrysler Winged badge on the wheel matches the black background-look of the exterior badging. Finishing interior touches include a black headliner and upper consoles, a black center console and an ‘S’ logo in the instrument cluster. Also standard in the ‘S’ model is the segment-exclusive dual-screen Blu-Ray system with HDMI input, two USB recharging ports, a 12-volt outlet and a 115-volt two-prong outlet. This system allows rear seat passengers to view standard and Blu-Ray DVDs or to play a high-definition video game system on the new, higher definition, screens. Wireless headphones allow back seat passengers to enjoy this state-of-the-art system without forcing front seat passengers to hear the accompanying audio. 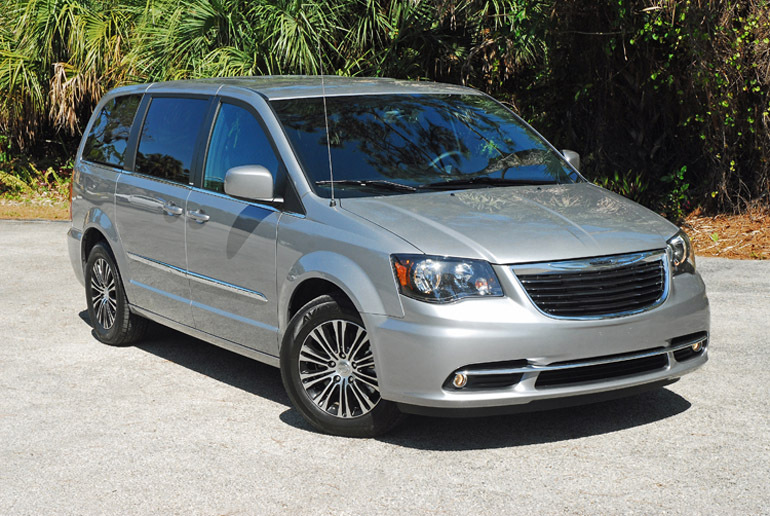 The ride of the Town & Country S is smooth and sporty because the suspension is tuned for sport that adds an unexpected level of handling dynamics to the driving experience, yet still provides a comfortable ride that’s expected in a luxury minivan. Up front is an independent MacPherson strut setup with coil-over gas-charged shocks, stabilizer bar and an isolated suspension cradle to eliminate any noise, vibration or harshness. The rear setup is a twist-beam axle with coil springs, track bar, gas-charged shocks and a stabilizer bar. Mated to a proven hydraulic rack & pinion steering system, the Town & Country S goes where I point it to go with quickness and precision. For a heavy minivan the steering system was boosted just right-easy to steer at slow parking lot speeds and heavier when traveling on the highway. 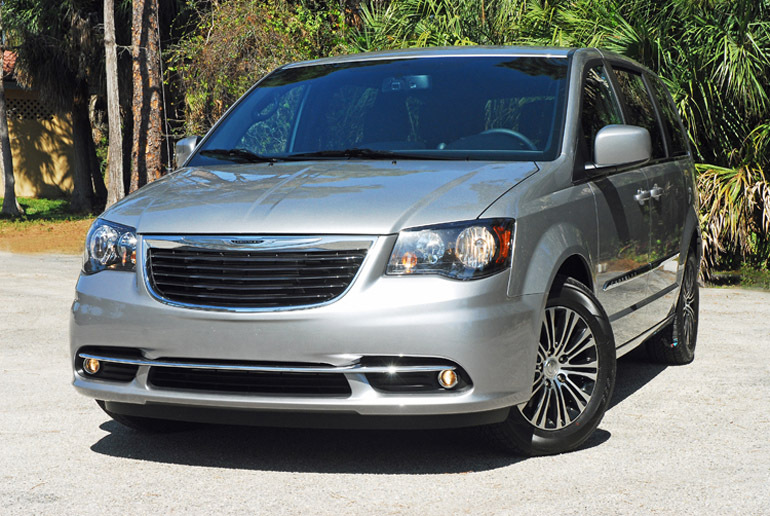 Safely slowing the new 2014 Chrysler Town & Country S down from speed are strong power-assisted steel disc brakes. Up front are 13 inch vented discs clamped with dual-piston calipers, and 12.9 inch solid discs clamped with single-piston calipers in the rear. Standard ABS, BA, Electronic Stability Control and Traction Control help me maintain a safe direction when braking hard and when braking on wet or slick pavement. The comfortable and luxurious interior is beautifully crafted with high-quality materials that are soft-to-the-touch including chrome bezels, and tech-savvy entertainment features and smart storage and seating options, including Stow ‘n Go underfloor storage and seating with one-touch fold-down function. The Uconnect suite of technologies is standard and offers touchscreen and voice command for convenient control of multiple media sources and outputs, including a handsfree phone. The optional Uconnect Web transforms the Town & Country into a ‘hot spot’ to deliver the Internet directly to the minivan for instant access to websites, e-mail and more. The optional Blu-ray DVD entertainment system with HDMI input, navigation, SiriusXM radio and SiriusXM Travel Link make the Chrysler Town & Country the ultimate family vehicle. My Town & Country S came with the second-row captain’s chairs for extra comfort. The sleek, one-piece instrument panel is crafted with premium materials and is intuitive for me. 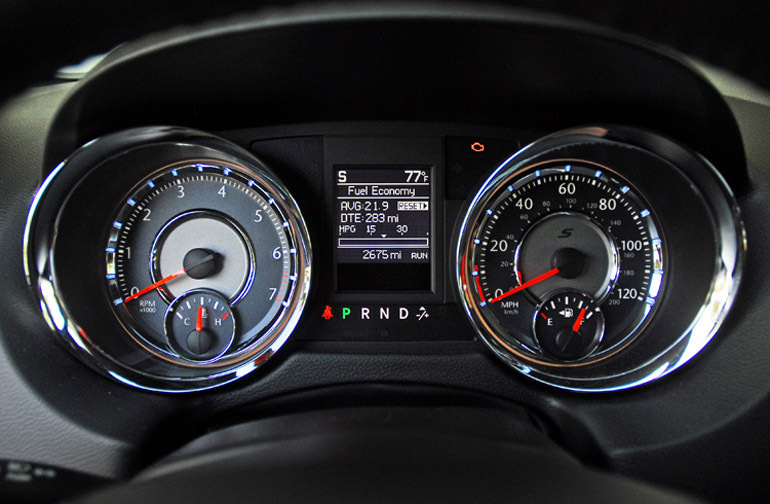 The instrument cluster is easy to see and understand with trip computer information readouts in the center. The center stack console has been designed with me in mind, offering superior ergonomics with premium materials and a pleasing appearance. 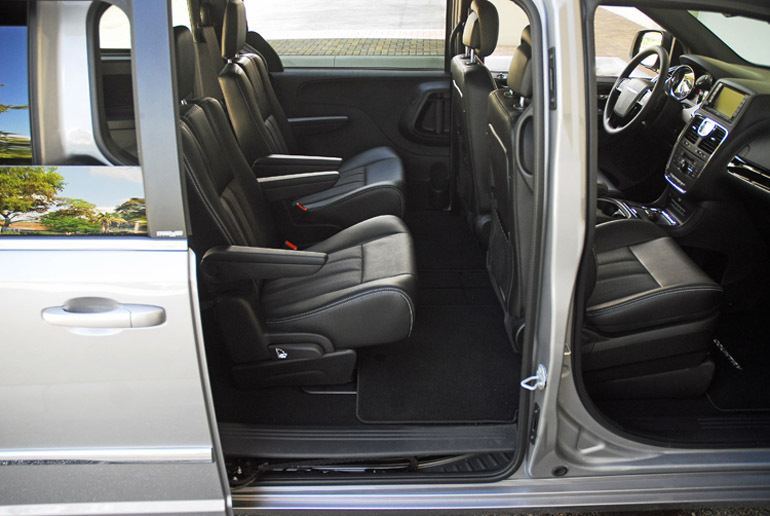 My Town & Country S came with the super center console that provides clever functionality and storage for CDs, DVDs, notepad and wallet and integrated power outlets, as well as easy driver/passenger access with a pass-through storage space for larger items. Trim rings in the console glow an ambient blue color, which allows passengers to find the items they are looking for at night. The tilt/telescoping/leather-wrapped steering wheel has integrated controls for audio, navigation and cruise control and, a minivan-first, a heated steering wheel option. More standard equipment in the Town & Country S model not mentioned above includes the Blu-Ray player, second-row overhead 9-inch VGA video screen, third-row VGA video screen, 2nd/3rd row Stow ‘n Go with 3rd row flip-up tailgate seats, Uconnect 430n CD/DVD/P3/HDD 40 GB hard drive with 28 GB available, Bluetooth streaming audio, 6.5 inch touch screen, A/C with tri-zone automatic temperature control, rear A/C with heater, power 8-way driver’s seat with power lumbar control, second-row power windows, power front one-touch up/down windows, power door locks, power quarter windows, rechargeable pop-out LED flashlight located in the right-side quarter panel, rear backup camera, remote USB port, grab handles all around, dual lighted vanity mirrors, self-dimming rearview mirror, dual map lights, rear dome reading lights, power sliding door, power liftgate, sunscreen glass, power-heated sideview mirrors, center console with dual cupholders and dual-tiered storage box/armrest and a dual-tired glove box. Standard safety systems include ParkView rear back-up camera, universal garage door opener, Eco fuel optimizer calibration, advanced multi-stage front airbags, supplemental side-curtain airbags in all rows, driver inflatable knee-bolster airbag, supplemental front seat-mounted airbags, LATCH system for child seats, 7-3-point safety belts with front pretensioners/load limiters, keyless entry with immobilizer, tire pressure monitor. For enhanced safety, my Town & Country S model came with the optional Preferred Package Safety Tec that included automatic high beam headlight control, Blind Spot and Cross Path Detection, ParkSense Rear Park Assist System, rain-sensing wipers/washers, rear wiper/washer, and a full tire pressure monitoring system. 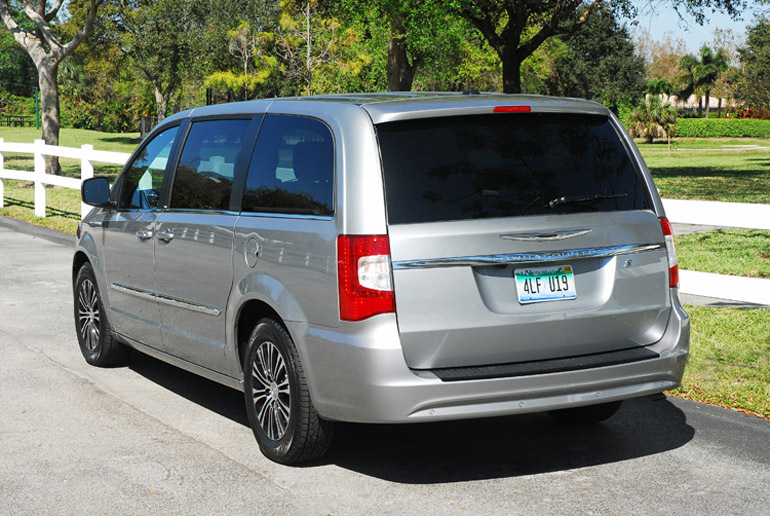 Since it first debuts in 1989 there have been many luxury minivans but there is still the original and still the best-the 2014 Chrysler Town & Country minivan. Total interior passenger volume: 163.5 cu.ft. Cargo volume: max-143.8/Behind second-row seats-83.3/Aft third-row-33 cu.ft. Total passenger and cargo: 195.8 cu.ft.